Cwm Craig Farm01432 840250work01432 840250fax FarmhouseCwm Craig is a 19th century Georgian farmhouse on a working farm offering bed & breakfast accommodation. Cwm Craig is set in 150 acres of the beautiful Wye Valley, an area of outstanding natural beauty. The three guest rooms have a separate entrance at the front of the property, where there is ample off road parking. There are two double rooms and one twin room. All are ensuite with TV, limited wi-fi access and tea and coffee making facilities. A small kitchen with a fridge, microwave, kettle and toaster is available for guests who wish to prepare a packed lunch or a light supper. An iron and board is also available. There is a large dining and sitting room and also a games room which has a top of the range pool table and a darts board. Central heating throughout and a fully fitted fire alarm system with emergency back up lighting. There are many pubs and restaurants within a few miles of Cwm Craig where guests can enjoy a delicious evening meal. Cwm Craig is a 19th century Georgian farmhouse on a working farm offering bed & breakfast accommodation. 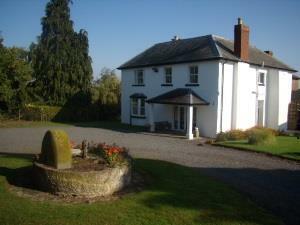 Cwm Craig is set in 150 acres of the beautiful Wye Valley, an area of outstanding natural beauty.